A prominent center gable with arched window accents the facade of this custom craftsman home, which features an exterior of cedar shakes, siding and stone. 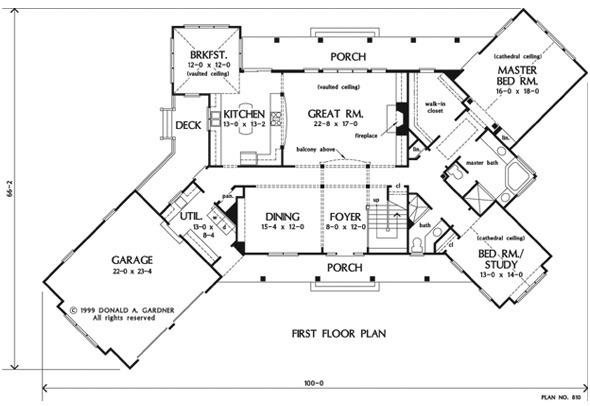 An open floor plan with generously proportioned rooms contributes to the home's spacious and relaxed atmosphere. The vaulted great room boasts a rear wall of windows, a fireplace bordered by built-in cabinets, and convenient access to the kitchen. A second floor loft overlooks the great room for added drama. The master suite is completely secluded and enjoys a cathedral ceiling, back porch access, a large walk-in closet, and a luxurious bath. The home includes three additional bedrooms and baths as well as a vaulted loft/study and bonus room. 1st Floor: 2477 Sq. 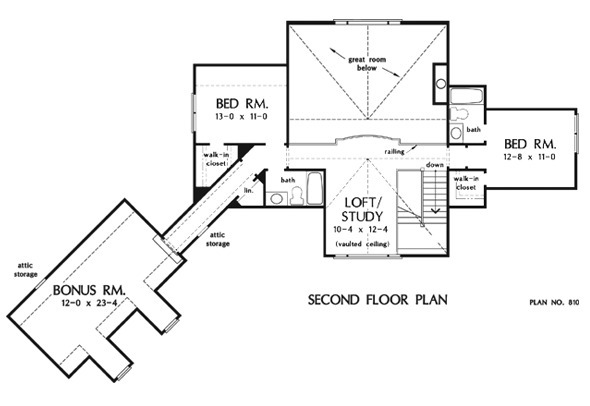 Ft.
2nd Floor: 742 Sq. Ft. Bonus Room: 419 Sq. 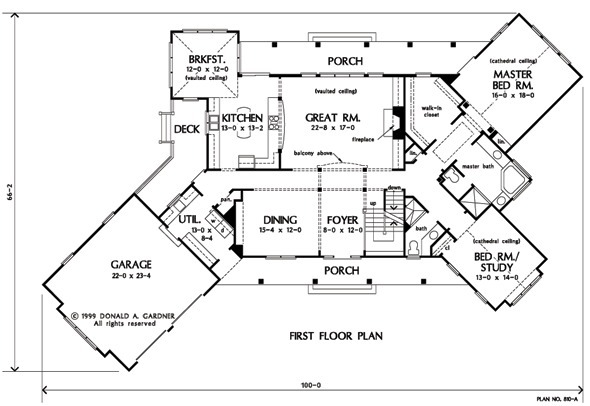 Ft.
House Dimensions: 100' 0" x 66' 2"
Great Room: 22' 8" x 17' 0"
Foyer : 8' 0" x 12' 0" x 9' 0"
Great Room (Vaulted): 22' 8" x 17' 0" x 23' 2"
Kitchen : 13' 0" x 13' 2" x 9' 0"
Breakfast Room (Vaulted): 12' 0" x 12' 0" x 15' 8"
Utility Room : 13' 0" x 8' 4" x 9' 0"
Bonus Room (Vaulted): 12' 0" x 24' 8" x 8' 6"
Garage : 22' 0" x 23' 4" x 0' 0"
Master Bedroom (Cathedral): 16' 0" x 18' 0" x 17' 2"
Bedroom / Study (Cathedral): 13' 0" x 10' 10" x 16' 2"
Bedroom #4 (Clipped): 13' 0" x 11' 0" x 8' 0"
Porch - Front : 46' 8" x 5' 0" x 0' 0"
Porch - Rear : 46' 4" x 6' 0" x 0' 0"
Deck / Patio : 6' 8" x 10' 6" x 0' 0"
Loft / Study (Vaulted): 10' 4" x 12' 4" x 13' 2"